Supporters of a new initiative hope to improve Lake Erie water quality and reduce costs for companies needing to meet environmental regulations. The Great Lakes Commission (GLC), a multi-state agency that promotes the use, development and conservation of Great Lakes resources, hopes to implement water quality trading in the western basin of Lake Erie over the next three years. The U.S. Department of Agriculture granted $400,000 to the commission to test the approach, said Victoria Pebbles, the program director for the commission that is based in Ann Arbor, Michigan. Water quality trading helps point sources – companies such as power plants or factories that release pollutants into the lake – reduce the cost of meeting nutrient run-off regulations, Pebbles said. Instead of paying for lengthy improvement projects that involve installing equipment, companies can work with farmers to reduce pollution. The use of fertilizer and manure on farms leads to water pollution, says a Great Lakes Commission report. 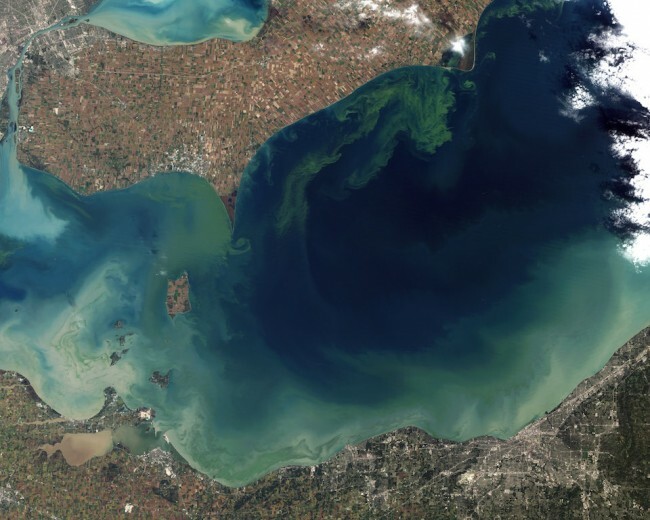 High levels of such nutrients could damage Lake Erie – too much phosphorus causes harmful algal blooms. These blooms make water unsafe for drinking and harmful to fish. A toxic bloom in 2014 left more than 400,000 residents in the Toledo area without access to public drinking water for two days. Last year, a bloom in Lake Erie lasted from July to September and was the worst of the century, according to the National Oceanic and Atmospheric Administration. It’s a significant problem because more than 11 million people rely on Lake Erie for drinking water and the lake supports a $1.5 billion sport fishing industry, according to the commission’s report. Under the trading system, farmers receive credits for reducing runoff into Lake Erie. These credits can be bought by other sources of pollution — called point sources – that need to reduce their own pollution. Point sources could be sewage treatment plants, power plants or factories that can use credits to fulfill pollution regulations without having to reduce their pollution directly. The initiative has other environmental benefits. When farmers construct a wetland or reduce runoff in other ways, they could also be providing habitat for plants and animals or decreasing the chance of a flood. “You get all these other benefits that really are just part of putting in a conservation practice, but the buyer isn’t paying for [them],” Pebbles said. The Great Lakes Commission is also implementing trading in Wisconsin, Pebbles said. That project aims to lower nutrients and algal blooms in Wisconsin’s Lower Fox River watershed. “In other trading programs around the country, trading has proven to provide a more cost effective solution,” Pebbles said. The commission is copying a water quality trading initiative involving Ohio, Kentucky and Indiana. The initiative in the Ohio River basin is headed by the Electric Power Research Institute (EPRI) and already involves at least 30 farms. It has proven to be a reliable and viable tool, said Chris Mahoney, the communications manager for EPRI. American Electric Power, Duke Energy and Hoosier Energy were the first point sources to buy into that program. Credits used for the initiative equate to one pound of total nitrogen, or one pound of total phosphorus, said Jessica Fox, a project manager at EPRI. EPRI has been conducting research regarding pollution and environmental markets for many years, and the Ohio River basin initiative will test whether market-based trading can be used to improve water quality. So far, so good, according to institute officials. Water quality trading is important ecologically and economically and is a great “alternative to installing less effective, more expensive technology,” said Mahoney. The project is the first and only interstate water trading program, and led EPRI to win the 2015 United States Water Prize for outstanding solutions to national water challenges. Water quality trading has raised some eyebrows though. The method has had mixed results in the past and circumstances need to be prime for everything to come together, said James Clift, the policy director for the Michigan Environmental Council. Another potential concern is the “local impact of having too much [pollution] come from a limited number of sources, because they’ve bought up everyone else’s credits,” he said. The only hope is that the water would dilute it, but it could cause a localized problem. Both of these concerns are addressed by the program, Fox said. Point sources are limited in how much they can use trading. Facilities cannot use trading to offset all of their regulation requirements. While the success of a water trading program is not guaranteed, it could help improve the water in Lake Erie, said Pebbles. The project will determine if it is effective. Lake Erie’s increased “impaired water quality, massive, summer-long algal blooms, hypoxia and fish kills” gives the public good reason to be concerned, according to the Great Lakes Commission report. “The bottom line is that what we’re doing isn’t working,” Pebbles said. “ We need to try a variety of different tools to see if we can make these improvements in western Lake Erie. Planning is underway and the project is expected to begin soon, Pebbles said. The public can no longer take for granted clean, pure water for drinking. We have been uninformed and careless as to the impact of human activities on water quality. There is no short cut as “feel good”, “tip toe”, cap and trade. The short term cost savings for some users will ultimately cost the public and may result in the need to ration water for many uses. At this time no one has an estimated cost, caused by polluted water, for the harm to the health of our citizens, environment, or economy. We will wake up. It is a matter of sooner or later. No more new regulations or lawsuits until EPA first acknowledges two major sources of nutrient pollution, that are presently ignored. 2. The impact of ‘green’rain’ or rain containing reactive nitrogen (fertilizer), the result of the burning of fossil fuels, the increased use if synthesized fertilizer and increased frequency of lightning storms, the result of global climate change. This is an important tool for taking steps on the ground that begin to turn the tide on phosphorous loading, but the problem is so pervasive, much more is needed: 1. Reshaping framework for immediate establishment of loading limits for Lake Erie and other waters of the Great Lakes basin; 2. Use of watershed, hydrologic cycle approach, through which inputs and activities causing phosphorous releases and loading are considered as a whole, and the water, fish, boating, navigation, swimming, and drinking water and other uses protected from impairment through the public trust doctrine that applies to all Great Lakes. These principles of non impairment impose an affirmative duty on all to change practices, and run farms or any land use and water based activity in a manner that does not contribute to algal blooms. The modeling and understanding exists, it now takes legal and ethical frameworks and comprehensive solutions.